Today’s the first day of December! In honor of the first day of this great month that we celebrate our Savior’s birth, here is a Christmas verse and painting. The Christmas Cactus is one of my favorite plants for several reasons. First of all, it blooms around Christmas – actually it will bloom all year round if you take good care of it (I tend to neglect it until October and then I give it tender loving care because I want to have those delicate beautiful blooms around the house during the cold months). Secondly, I love it because it reminds me of my Granny. She had a green thumb and had these around her house. I always think of her when I see them. The third reason I love these plants is because they are hardy – meaning they can withstand just about anything and they don’t get bugs – they’re just all around good plants to have. The other day I was at Publix and they had some little Christmas Cactus on sale and I couldn’t resist buying one. I have one in my office, but placed this one in my kitchen. The one in my office is still trying to revive itself after a long summer of neglect, so it doesn’t have many blooms on it right now. 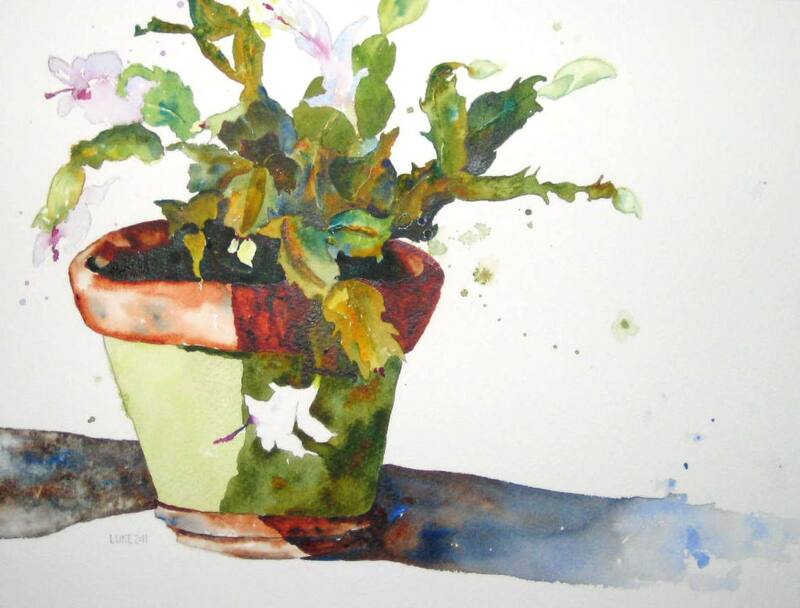 After weeks of not painting I was finally inspired to paint my new little Christmas Cactus! It’s not the best painting I’ve done, but it turned out better than I thought it would after going so long without painting. Happy early Christmas! i love it Sandi!!! it is beautiful!!! Beautiful, Sandi!! It really is! And yes, we’re still at LBHC – I see you often, but you’re usually talking with someone and I don’t want to interrupt, OR, I see you going in a door while I am going out another one. I saw your mom before a service a while back and told her how much I enjoy your paintings! Thank you Becky! I miss seeing you. LHB is so big sometimes you don’t run into someone for a year or more. Thanks for taking time to look at my blog and for sending encouraging notes :)!